The Greatest Showman is a 2017 American musical film directed by Michael Gracey in his directorial debut, written by Jenny Bicks and Bill Condon and starring Hugh Jackman, Zac Efron, Michelle Williams, Rebecca Ferguson, and Zendaya. The film is inspired by the story of P. T. Barnum's creation of the Barnum & Bailey Circus and the lives of its star attractions. Principal photography began in New York City in November 2016. The film premiered on December 8, 2017, aboard the RMS Queen Mary 2. It was released in the United States on December 20, 2017, by 20th Century Fox and grossed over $434 million worldwide, making it the fifth-highest grossing live-action musical of all time. The film was released seven months after Ringling Bros. and Barnum & Bailey Circus's dissolution. Principal photography began in New York City in November 2016. The film premiered on December 8, 2017, aboard the RMS Queen Mary 2. It was released in the United States on December 20, 2017, by 20th Century Fox and grossed over $434 million worldwide, making it the fifth-highest grossing live-action musical of all time. The film was released seven months after Ringling Bros. and Barnum & Bailey Circus's dissolution. Carlyle and Wheeler attend the theater together one night only to run into Carlyle's parents, who make racist remarks toward Wheeler. After Wheeler runs off, Carlyle angrily berates them, then chases Wheeler and tries to convince her that they can be together, but she rejects him despite her feelings for him ("Rewrite the Stars"). As Barnum takes Lind on a US tour, Charity feels isolated from her husband as she stays home with their daughters ("Tightrope"). While on tour, Lind begins falling in love with Barnum. When he refuses her advances, she threatens to quit and orchestrates a kiss from him at the end of her last show, which is photographed by the press ("Never Enough (Reprise)"). Barnum returns home to find his circus on fire, caused by a fight between the protesters and the troupe. Carlyle runs into the burning building, believing that Wheeler is still inside, and is rescued by Barnum amid the chaos, suffering serious injuries. The next day, Barnum gets word from a sympathetic Bennett that the culprits have been caught, and that Lind has canceled her tour after her and Barnum's "scandal", resulting in his mansion being foreclosed upon and Charity taking Caroline and Helen to her parents' home. Depressed, Barnum retreats to a local bar where his troupe find him and explain that despite their disappointments, they still consider themselves a family that needs him. An inspired Barnum resolves to start anew and not let ambition overtake his loved ones anymore ("From Now On"). Meanwhile, the injured Carlyle wakes in a hospital with Wheeler by his side. Barnum finds his wife and they mend their relationship. Faced with the financial difficulty of rebuilding the circus, the recovering Carlyle steps in offering to use his earnings from his share of the circus's profits to rebuild it under the condition of becoming a full partner, which Barnum happily accepts. As rebuilding the circus in its original location would be too expensive, Barnum transforms it into an open-air tent circus by the docks. The revamped circus is a huge success, and Barnum gives full control of the show to Carlyle so he can focus on his family ("The Greatest Show (Reprise)"). Zac Efron as Phillip Carlyle, a playwright who becomes Barnum's partner. His character is partly based on James Anthony Bailey. Sam Humphrey as Charles Stratton, a dwarfish performer who is also known by his stage name General Tom Thumb. In performing this role, Humphrey had to walk on his knees with his legs being edited through CGI. Alex Wong as Oriental Man, a man dressed in an oriental outfit. He was credited as "Ensemble Dancer #2." DeAnna Walters and Jessica Castro as the Voodoo Twins. They are credited as "Ensemble Dancer #5" and "Ensemble Dancer" #6. On November 16, 2018. 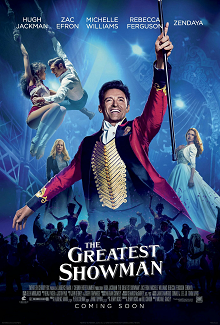 20th Century Fox released a cover album entitled The Greatest Showman: Reimagined, featuring a variety of artists. Britton Peele of The Dallas Morning News said, "The story is interesting and the beats are well-acted, but it's the musical numbers that make The Greatest Showman." Jackie K Cooper of HuffPost gave the film a score of 10/10 and wrote, "You will be overwhelmed by the music and magic that explode on the screen. The film has a message that should resonate with today's world concerning acceptance and courage." Hugh Armitage of Digital Spy said, "The Greatest Showman is a broad and solid crowd-pleaser. An undemanding spectacle for all the family." Alan Jones of Radio Times called it "A joyously uplifting potpourii of visual resplendence, stylish choreography and solid gold magic, one engineered to approximate the lavish spectacle the movie musical once offered." ↑ "The Greatest Showman". AMC Theatres. Retrieved November 22, 2017. ↑ Lang, Brent (December 5, 2017). "Hugh Jackman on The Greatest Showman, Saying Goodbye to Wolverine and Turning Down Bond". Variety. Retrieved December 6, 2017. 1 2 "The Greatest Showman (2017)". Box Office Mojo. Retrieved August 17, 2018. ↑ Giles, Jeff (December 21, 2017). "Jumanji: Welcome to the Jungle is Certified Fresh". Rotten Tomatoes. Retrieved December 21, 2017. ↑ McCreesh, Louise (December 20, 2017). "The Greatest Showman review round-up: A "crowd-pleaser" with a "sinister" side". Digital Spy. Retrieved December 21, 2017. ↑ Nourrie, Doug (December 25, 2017). "This Rotten Week: Predicting All The Money In The World Reviews". CinemaBlend. Retrieved January 7, 2018. ↑ Hayes, Heather (January 17, 2018). "Discover Utah's Loren Allred, the voice behind the hit song 'Never Enough' from The Greatest Showman soundtrack". Deseret News. Retrieved April 18, 2018. ↑ Allred, Loren (November 13, 2017). "[post]". Instagram. Retrieved April 18, 2018. ↑ McHenry, Jackson (2019-02-22). "The Behind-the-Scenes History of Hugh Jackman's Opening Number at the 2009 Oscars". www.vulture.com. Retrieved 2019-02-26. ↑ Jagernauth, Kevin (August 11, 2011). "Michael Gracey To Direct Hugh Jackman Musical The Greatest Showman On Earth". IndieWire. Retrieved July 10, 2017. ↑ McClintock, Pamela; Kit, Borys (August 17, 2011). "Michael Gracey to Direct The Greatest Showman on Earth". The Hollywood Reporter. Retrieved July 12, 2016. ↑ Grobar, Matt (November 17, 2017). "The Greatest Showman Songwriters Benj Pasek & Justin Paul On The Revitalization Of The Original Hollywood Musical". Deadline Hollywood. Retrieved April 18, 2018. ↑ McNary, Dave (June 15, 2016). "Zac Efron in Talks to Join Hugh Jackman's Greatest Showman (Exclusive)". Variety. Retrieved June 16, 2016. ↑ McNary, Dave (July 6, 2016). "Michelle Williams in Talks for Hugh Jackman's Greatest Showman on Earth". Variety. Retrieved January 5, 2018. ↑ Pulver, Andrew (July 8, 2016). "Michelle Williams and Zac Efron sought for PT Barnum biopic". The Guardian. Retrieved January 5, 2018. ↑ Jaafar, Ali (July 6, 2016). "Michelle Williams In Talks To Join The Greatest Showman With Hugh Jackman". Deadline Hollywood. Retrieved January 5, 2018. ↑ Giroux, Jack (July 7, 2016). "Michelle Williams Joins Hugh Jackman in The Greatest Showman on Earth". SlashFilm. Retrieved January 5, 2018. ↑ Gold, Sylvaine (December 19, 2017). "Meet the Man Behind Hugh Jackman's Moves in The Greatest Showman". Dance Magazine. Retrieved December 19, 2017. ↑ Christine (November 10, 2016). "The Greatest Showman, starring Hugh Jackman & Zac Efron, begins filming in NYC soon!". On Location Vacations. Retrieved November 17, 2016. ↑ La Cioppa, Bianca (October 25, 2016). "A personal touch: Hugh Jackman sings happy birthday to good pal Zac Efron". The Daily Mail. Retrieved November 23, 2016. ↑ Stack, Tim (December 22, 2017). "The Greatest Showman Director On The Epic Musical Numbers And If It Could Head To Broadway". Entertainment Weekly. Retrieved December 22, 2017. ↑ Burlingame, Jon (January 4, 2018). "'This Is Me' From The Greatest Showman Is an Anthem for Outcasts". Variety. Retrieved January 17, 2018. ↑ Copsey, Rob (March 23, 2018). "The Greatest Showman soundtrack equals Adele's massive UK chart record". Official Charts Company. Retrieved April 18, 2018. ↑ "The Greatest Showman soundtrack beats Adele's UK album chart record". BBC News. December 28, 2018. Retrieved February 18, 2019. ↑ Copsey, Rob (January 25, 2019). "Albums with the most weeks at Number 1 on the Official Albums Chart". Official Charts Company. Retrieved February 18, 2019. ↑ Anderton, Ethan (October 9, 2018). "'The Greatest Showman' Soundtrack Is Getting Reimagined with Kelly Clarkson, Panic! at the Disco & More". Slashfilm. Retrieved October 9, 2018. ↑ Chitwood, Adam (October 9, 2018). "'The Greatest Showman' Is Getting a Covers Album Featuring P!nk, Kelly Clarkson, and More". Collider. Retrieved October 9, 2018. ↑ Cunard Line (December 6, 2017). "Cunard to Broadcast Live Red Carpet from The Greatest Showman World Premiere on Flagship Queen Mary 2". PR Newswire. Retrieved 2017-12-08. ↑ Tartaglione, Nancy (November 13, 2017). "The Greatest Showman Trailer: Hugh Jackman's Singing & Dancing Ringmaster". Deadline Hollywood. Retrieved 2017-11-14. ↑ "The Greatest Showman: Sing-Along (PG)". British Board of Film Classification. 2018-01-25. Retrieved 2018-02-11. ↑ Rivera, Joshua (June 28, 2017). "Hugh Jackman Is Fun Again in The Greatest Showman Trailer". GQ. Retrieved 2017-11-24. ↑ Ramos, Dino-Ray (December 18, 2017). "The Greatest Showman Live Movie Trailer Electrifies During A Christmas Story Live". Deadline Hollywood. Retrieved 2017-12-18. ↑ Natividad, Angela (2017-12-18). "Hugh Jackman's Live Ad Last Night for The Greatest Showman Was Quite the Circus". Adweek. Retrieved 2017-12-18. ↑ "The Greatest Showman: Movie Plus Sing-Along". Amazon. Retrieved 2018-04-18. ↑ Simpson, George (2018-02-28). "The Greatest Showman home release dates REVEALED for Blu-ray, DVD and Digital Download". Daily Express. Retrieved 2018-04-18. ↑ Tartaglione, Nancy (March 29, 2018). "This Is $400M+: The Greatest Showman Hits WW Milestone On Feel-Good Legs". Deadline Hollywood. Retrieved March 29, 2018. ↑ D'Alessandro, Anthony (November 28, 2017). "Does 2017's Domestic Box Office Stand A Chance To Eclipse Last Year's All-Time $11.4B Record?". Deadline Hollywood. Retrieved November 29, 2017. ↑ McNary, Dave (December 19, 2017). "Jumanji, Greatest Showman, Pitch Perfect to Challenge the Star Wars Box Office Force". Variety. Retrieved December 19, 2017. 1 2 D'Alessandro, Anthony (December 26, 2017). "'Last Jedi' Now At $99M, 'Jumanji' Huge At $72M+; 'All The Money In The World' Opens To $2.6M – Christmas Weekend". Deadline Hollywood. Retrieved December 26, 2017. ↑ D'Alessandro, Anthony (December 31, 2017). "'Last Jedi' & 'Jumanji' Duel For No. 1 Over New Year's Weekend As 2017 Box Office Closes With $11.1B – Sunday Update". Deadline Hollywood. Retrieved December 31, 2017. ↑ "Smallest Second Weekend Drop: 1982–Present". Box Office Mojo. Retrieved January 3, 2018. ↑ Mendelson, Scott (December 31, 2017). "Hugh Jackman's The Greatest Showman Just Set A New Box Office Record". Forbes. Retrieved January 1, 2018. ↑ D'Alessandro, Anthony (January 7, 2018). "'Jumanji' Goes Wild With $36M; 'Insidious' Rises To $29M+ – Sunday AM B.O. Update". Deadline Hollywood. Retrieved January 7, 2018. ↑ D'Alessandro, Anthony (January 21, 2018). "January Slows As Jumanji Takes No. 1 For 3rd Weekend With $19M To $20M; Older Guy Pics 12 Strong & Den Of Thieves In Mid-Teens". Deadline Hollywood. Retrieved January 21, 2018. ↑ D'Alessandro, Anthony (January 28, 2018). "Fox Controls Close To 40% Of Weekend B.O. Led By Maze Runner & Oscar Holdovers; Hostiles Gallops Past $10M". Deadline Hollywood. Retrieved January 28, 2018. ↑ D'Alessandro, Anthony (February 4, 2018). "Jumanji Poised To Be Dwayne Johnson's Highest Grossing Pic Of All-Time Stateside After Super Bowl Weekend Rebound". Deadline Hollywood. Retrieved February 4, 2018. ↑ "Top Grossing Movies that never hit #1, the Top 5 or Top 10". Box Office Mojo. Retrieved January 31, 2017. ↑ "The Greatest Showman (2017)". Rotten Tomatoes. Retrieved January 29, 2019. ↑ "The Greatest Showman Reviews". Metacritic. Retrieved December 22, 2017. ↑ Gleiberman, Owen (December 20, 2017). "Film Review: The Greatest Showman". Variety. Retrieved December 20, 2017. ↑ Roeper, Richard (December 20, 2017). "Catchy songs steal the show in The Greatest Showman". Chicago Sun-Times. Retrieved December 20, 2017. ↑ Persall, Steve (December 20, 2017). "Why The Greatest Showman is the feel-good movie the holiday season needs". Tampa Bay Times. Retrieved April 18, 2018. ↑ Bibbiani, William (December 20, 2017). "The Greatest Showman review". IGN. Retrieved April 18, 2018. ↑ Peele, Britton (December 20, 2017). "Catchy musical The Greatest Showman, like its central character, reshapes truth for entertainment". The Dallas Morning News – GuideLive. Retrieved April 18, 2018. ↑ Cooper, Jackie K (December 21, 2017). "The Greatest Showman Is Movie Magic". HuffPost. Retrieved April 18, 2018. ↑ Armitage, Hugh (December 20, 2017). "The Greatest Showman review – An undemanding spectacle for all the family". Digital Spy. ↑ Jones, Alan (December 20, 2017). "The Greatest Showman review: "pure musical entertainment of a sumptuous vintage"". Radio Times. Retrieved December 20, 2017. ↑ O'Malley, Sheila (December 20, 2017). "The Greatest Showman". RogerEbert.com. Retrieved April 18, 2018. ↑ Davidson, Douglas (December 15, 2017). "The Greatest Showman is an undeniable spectacle with a infectious soundtrack". CLTure. Retrieved April 18, 2018. ↑ Berardinelli, James (December 21, 2017). "The Greatest Showman film review". ReelViews. Retrieved April 18, 2018. ↑ Wilson, Calvin (December 20, 2017). "Hugh Jackman shines in The Greatest Showman". St. Louis Post-Dispatch. Retrieved April 18, 2018. ↑ Kozlowski, Carl (December 21, 2017). "The Greatest Showman provide an eclectic feast for the senses". Pasadena Weekly. Retrieved April 18, 2018. ↑ Means, Sean P. (December 20, 2017). "Hugh Jackman and some Utah-grown talent deliver Barnum's bravado in musical The Greatest Showman". The Salt Lake Tribune. Retrieved April 18, 2018. ↑ Lazic, Manuela (December 20, 2017). "The Greatest Showman Review". Little White Lies. Retrieved April 18, 2018. ↑ Hammond, Pete (December 20, 2017). "The Greatest Showman Review: Hugh Jackman Sings And Dances His Way Into Holiday Hearts In Lively Family Musical". Deadline Hollywood. Retrieved April 18, 2018. ↑ LaSalle, Mick (December 20, 2017). "Greatest Showman starring Hugh Jackman as Barnum magnificently idiotic". San Francisco Chronicle. Retrieved December 20, 2017. ↑ "The Greatest Showman: Film Review". The Hollywood Reporter. December 20, 2017. Retrieved December 20, 2017. ↑ Travers, Peter (December 19, 2017). "Review: The Greatest Showman Is 'a Shrill Blast of Nothing'". Rolling Stone. Retrieved December 21, 2017. ↑ Chang, Justin (December 20, 2017). "The Greatest Showman turns Hugh Jackman's P.T. Barnum into a hero, and cons the audience in the process". Los Angeles Times. Retrieved December 21, 2017. ↑ Appelo, Tim (February 5, 2018). "Complete List of Winners at the 2018 Movies for Grownups Awards". Movies for Grownups. AARP. Retrieved April 18, 2018. ↑ THR Staff (January 23, 2018). "Oscars: 'Shape of Water' Leads With 13 Noms". The Hollywood Reporter. Retrieved January 23, 2018. ↑ Variety Staff (March 4, 2018). "Academy Award Winners 2018: The Complete List". Variety. ↑ Weatherby, Taylor (October 9, 2018). "Here Are All the Winners From the 2018 AMAs". Billboard. Retrieved October 12, 2018. ↑ Brockington, Ariana; Caranicas, Peter (January 18, 2018). "'Dunkirk,' 'Black Mirror' Among Winners at Casting Society Artios Awards". Variety. Retrieved January 19, 2018. ↑ Stone, Sasha (January 10, 2018). "Costume Designers Guild Announces Nominees". Awards Daily. Retrieved January 10, 2018. ↑ Kilday, Gregg (December 6, 2017). "Critics' Choice Awards: 'The Shape of Water' Leads With 14 Nominations". The Hollywood Reporter. Retrieved December 6, 2017. ↑ Kilday, Gregg (January 10, 2018). "'Call Me by Your Name' Leads Dorian Award Nominations". The Hollywood Reporter. Retrieved January 10, 2018. ↑ Kilday, Gregg (January 31, 2018). "Dorian Awards: 'Call Me by Your Name' Hailed as Film of the Year". The Hollywood Reporter. Retrieved January 31, 2018. ↑ "2017 Awards". Georgia Film Critics Association. January 8, 2018. Retrieved January 8, 2018. ↑ Respers, Lisa (December 11, 2017). "Golden Globe nominations 2018: The list". CNN. Retrieved December 11, 2017. ↑ Giardina, Carolyn (January 22, 2018). "MPSE Golden Reel Awards: Baby Driver, Dunkirk Among Sound Editors' Nominees". The Hollywood Reporter. Retrieved January 23, 2018. ↑ "Awards". GRAMMY.com. 2017-04-30. Retrieved 2018-12-29. ↑ Variety staff (January 11, 2018). "Sufjan Stevens, Greatest Showman, Girls Among Guild of Music Supervisors Awards Nominees". Variety. Retrieved January 12, 2018. ↑ "Truly Moving Picture Award". Heartland Film. Retrieved February 10, 2017. ↑ Haring, Bruce (March 24, 2018). "Nickelodeon Kids' Choice Awards 2018 Winners – The Complete List". Deadline Hollywood. Retrieved June 23, 2018. ↑ Giardina, Carolyn (January 5, 2018). "Makeup Artists and Hair Stylists Guild Awards: 'Darkest Hour,' 'Wonder' Lead Feature Nominees". The Hollywood Reporter. Retrieved January 5, 2018. ↑ Chitwood, Adam (June 28, 2018). "'Black Panther' Tops Saturn Awards with Five Wins; 'The Last Jedi' Takes Best Screenplay". Collider. Retrieved June 28, 2018. ↑ Douglas, Esme. "Teen Choice Awards 2018: See the full list of winners". EW. Archived from the original on August 13, 2018. Retrieved August 13, 2018. ↑ Wootton, Dan (February 22, 2019). "Hugh Jackman secretly begins work on The Greatest Showman sequel after huge success of first movie". The Sun. Retrieved February 23, 2019.